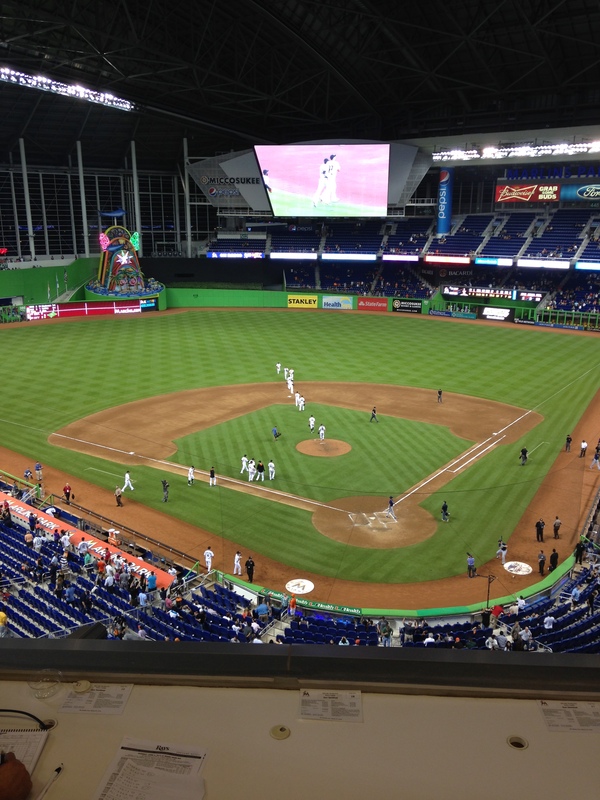 This is my view from the press box at Marlins Park. I’m still working on my photography skills. MIAMI — Hello there. My name is Maria Torres and I graduated from UGA about a month ago. Three weeks after that, I started an internship as a Marlins reporter for MLB.com. It’s a lot of work. This past weekend, I spent a lifetime covering rounds 3-40 of the First-Year Player Draft and writing blurbs about every player the Marlins selected on Friday, in rounds 3-10. Had to find an “interesting” story for the later rounds on Saturday. Both days, I had to get on the phone with the vice president of scouting when the last round ended and then transcribe the conversations so the other Miami writers who followed the team to Chicago could write about the Draft too. I had to call a high school coach in California for stats on one of the higher-round picks and I had to resign myself to no stats for a local kid whose coach I couldn’t even find an email address for. After it all, I reviewed the Draft and wrote a piece that looked at the progression of last year’s Draft picks. But I wouldn’t trade the 3500 words I wrote sitting at a kitchen table all weekend for the world. Game days are long. For a night game, I arrive around 2:30 pm and don’t leave until 11 pm, if I’m lucky. You write three or four 300-400 word notes (signings, trades, injuries, any general news and occasionally some color), type up some grafs to send to whoever is in charge of the game preview for the next day, keep a running gamer and then do a write-through of it. You also have to factor in interviews, which can take anywhere from 10 minutes to a whole hour, if it’s pre-game. People will tell you when you’re going into the business that you spend a lot of time waiting. They’re not kidding. One day, all I wanted to do was talk to the Marlins’ Christian Yelich for a pre-game notebook item but I never saw the guy in the 45 minutes I stood in the clubhouse. So you have to have an arsenal of backup ideas when you’re covering an entire game, otherwise you’ll waste a lot of time. And once you have all the quotes, you try to file the notebook and help with the preview in the two hours before the game. That way the only thing you have on your mind during the game is the gamer, which is one the most important duties I have. MLB.com prides itself on gamers. So yes. It’s a lot. I’m a secondary reporter for a team I didn’t even grow up watching. But I’m glad I’m getting a taste of what it’s like to actually cover a beat. I’ve got another four months or so left here in South Florida, depending on how far the Marlins go, so you’ll hear from me soon. In the meantime, feel free to follow me on Twitter (@maria_torres3) and contact me. Hope this helps anyone who wants to apply to MLB.com in the future!